I needed to talk with…and see the facilities of…a frame & chassis specialty company in downtown Orlando. They have widespread fame among diesel motor coach owners for their ability to bring perfect harmony and driveability to our behemoths. We don’t really have any problems, but we are parked only 75 miles away and I wondered what they might do for us. So we made a day of it. Did I mention the chassis shop was 10 miles from Disney? And the weather was sunny and 73? We quickly did our business (we don’t need the shop now, maybe next year when we’re back here), and headed to Downtown Disney Marketplace. 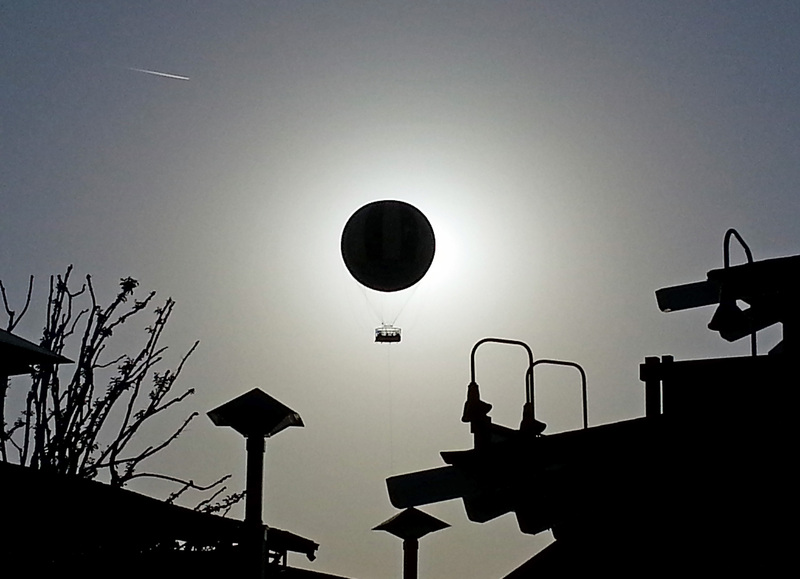 As we dropped in, Robyn caught the solar eclipse caused by the tethered hot air balloon ride at the park. We ate on the patio at the Earl of Sandwich, serenaded by Lion King music and entertained by dancing jets of water in the sidewalk. Ross & Ryan were enchanted. The capper was Ghirardelli chocolate ice cream and hot cocoa! 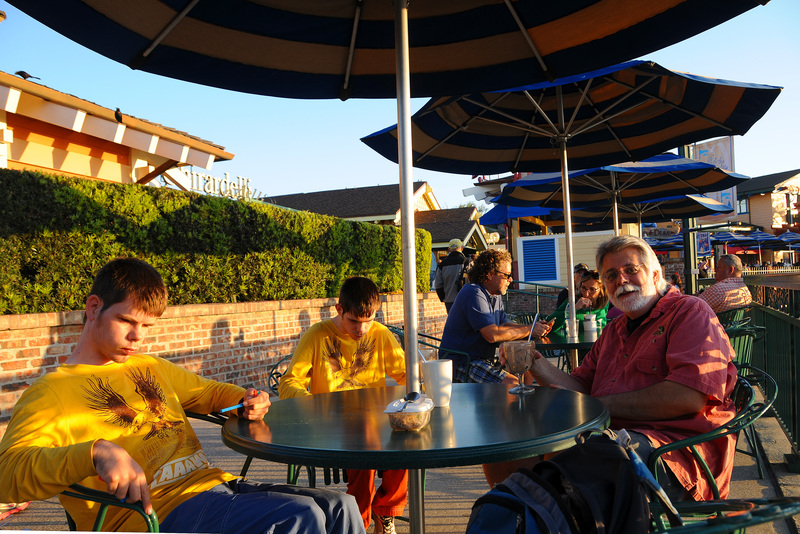 Oh woe, we forgot to shop for Maddie Callender’s “Hazelnut Heaven” dark chocolate candy while we were there…. Almost every morning, Robyn has walked our park near sunrise. She has help waking up for it….but then one or the other helper usually goes back to sleep. Not only does she catch views of the boil as its warmer water opens out into the cooler run and fog rises, not only does she see the landscape bathed in the glorious orange/gold of sunrise, not only does she hear the wildlife begin its day of chirps and calls and rustling through the underbrush, she also gets to meet so many members of our wildlife community up close and personal! All within a single view yesterday she had a pair of otters in the water, a pair of bald eagles and a pair of osprey fishing, and several manatees in the water! She took all the following photos this morning, with a little help from the marina operator who had to move a pontoon boat from storage to the dock. 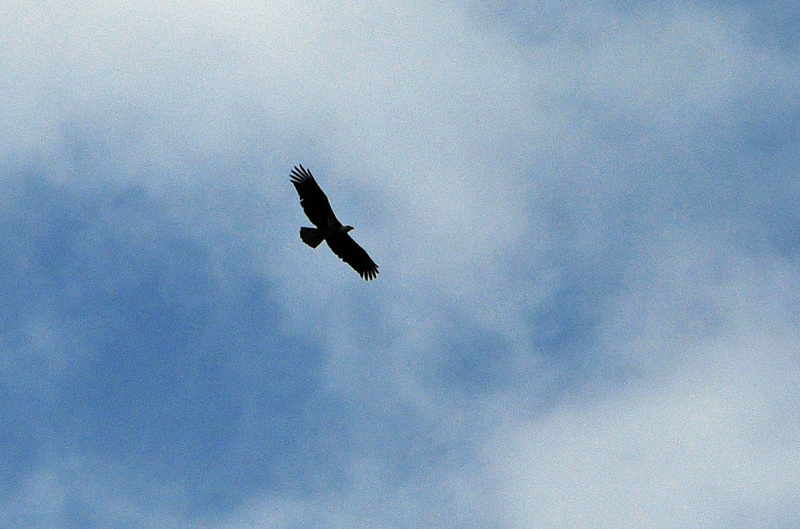 Which leads to one caveat: the eagle was a surprise, and Robyn shot while standing on the moving boat under throttle…. The amazing thing is that the photo of the eagle with its wings outstretched is shown here full-frame….it was that close! The same is true for the manatee. The final two photos are of the same Osprey. I’m still surprised by the dramatic difference of its coloration from underside to topside! We’ve always been respectful of the wind that Florida can provide….I think they’re called hurricanes….and we intend not to be here during that season. But we had an interesting day yesterday because of the wind. Sunny day but quite cool…we never saw higher than 52…and windyyyyy. Decided to see the Atlantic coastline. 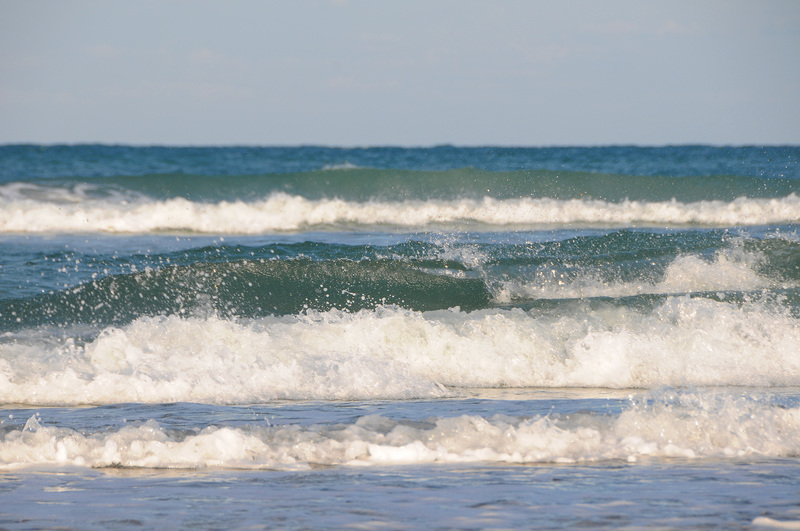 The weird part was that big waves were meeting huge winds blowing almost straight off-shore. You can see how the tops are blown up and back! 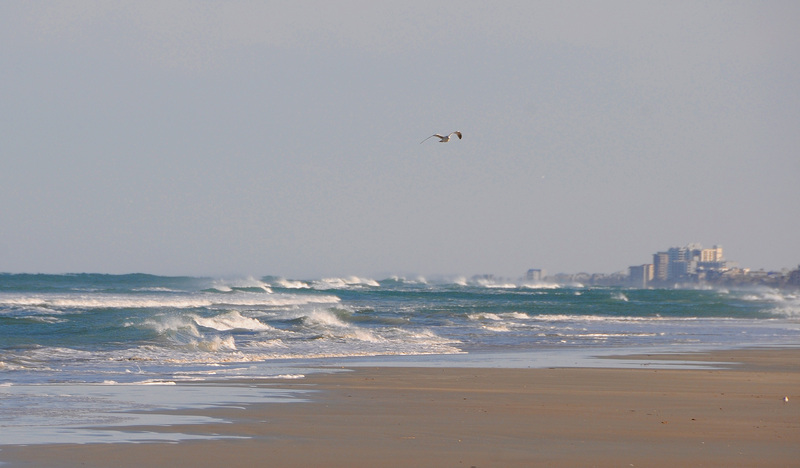 Perfectly lovely day, so long as you were looking through car windows as you drove along the beach! We walked briefly with jackets and down vests. 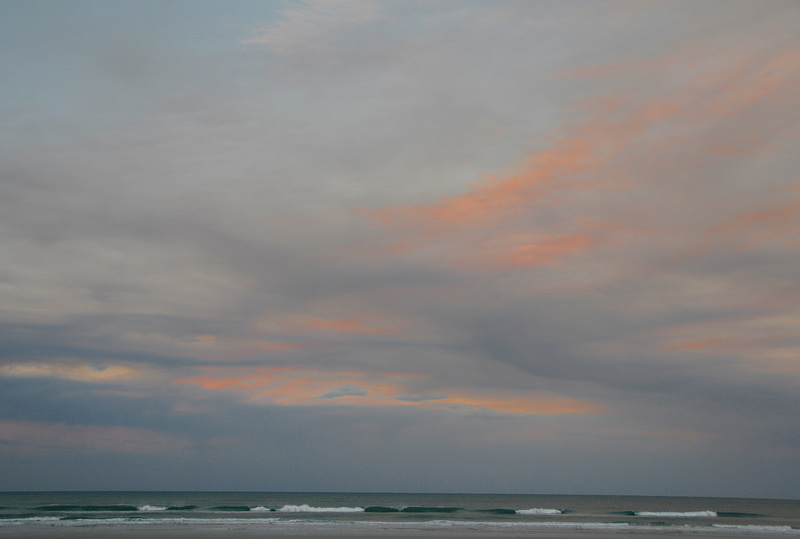 For being such a day of windy bombast, the sky was so softly colored at sundown…. On the way home, we were detoured by two different grass fires! One shut down I-95 south of Daytona Beach, and one closed our park’s road from the south where we were driving. That was good, because the wind was blowing northwesterly, so our park wouldn’t be getting the smoke. Eventually got home….to find that a tree between our site and the next one had blown over during the day! Fortunately it blew back between us, and came the closest to threatening the neighbor’s rig. It was all cleaned up when we got back…..
Whew, we’ve been cut off for days….by some days of rain (who knew Florida could have rain? ), by some days where Ryan occupied all our attention with his behaviors, by some days to recover from that, by some days to wash the coach from the top of its roof down to the tires….and wax & polish everything, and days to recover from that! Still haven’t made it over to the horse events in Ocala. We’ll see…..
We took a scenic route to get groceries one day, and stopped at a state park along the way. Paynes Prairie Preserve, between Ocala and Gainesville. Hey, that’s where Rich and Laura stayed last year after leaving us in Georgia! Robyn spotted 5 eagles within minutes. Her binoculars reach farther than my lens so I barely caught one. 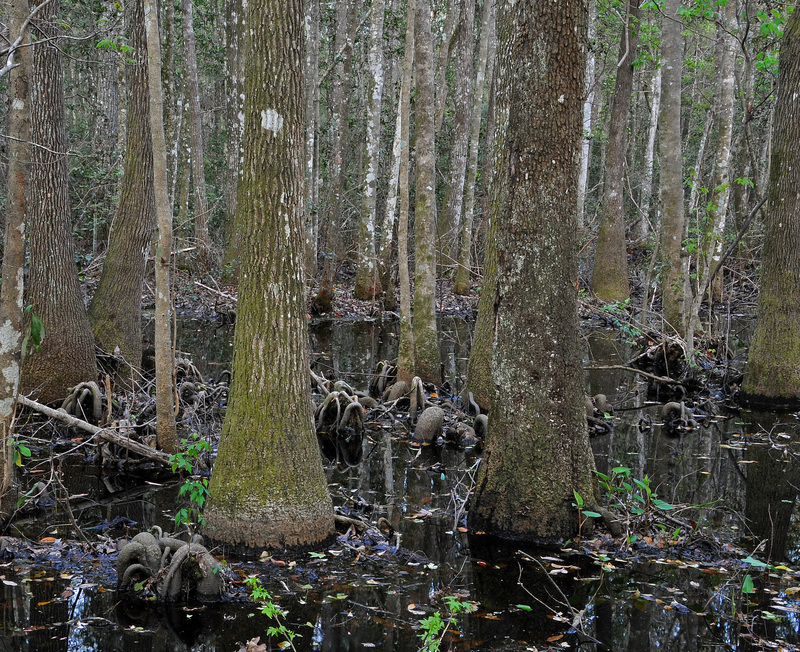 We passed these trees standing in water with the strange roots. 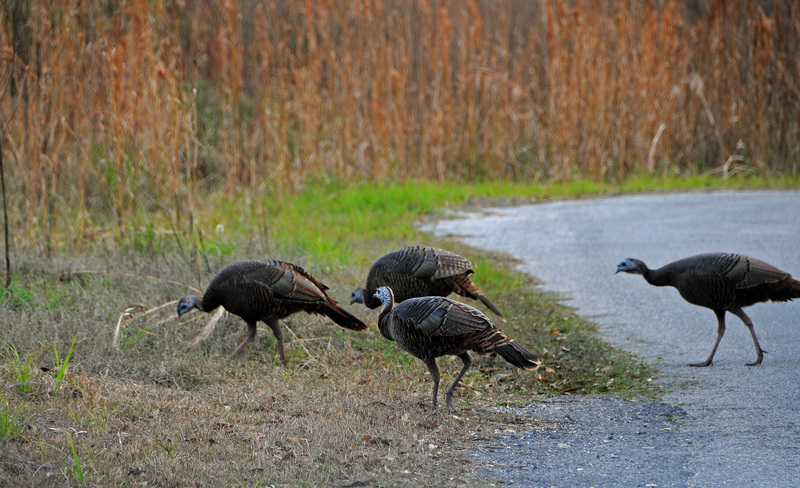 And on our way out, we had to wait for a band of turkeys to waddle across the road. It was a great stop! Some of you probably don’t understand how strange our lives can be. 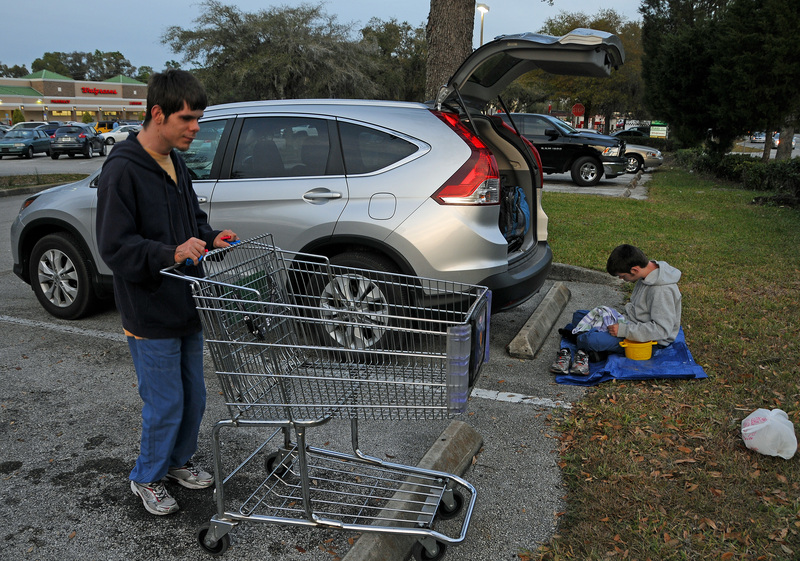 When we stop for groceries, one of us goes in and one of us stays at the car with Ross and Ryan. Often, they take turns walking around the parking lot with us because they benefit from the exercise. That usually leads to a wet diaper. Hmmm, how to change a diaper in a busy parking lot? First, park on an outer edge, preferably near some hedge or wall. Then use two open doors to shield a boy standing beside the car and your body blocks the public view. Robyn can change a wet diaper while the boy stands, exposing only one leg at a time. Okayyyyyyyyy, what about a pooper? This picture shows the aftermath of such an event with Ryan, where he laid on the small tarp we carry. Ross had been changed but still wanted to be out, so Robyn had him stand with the shopping cart….corralled as it was….but he was happy. Sorry if this was TMI. 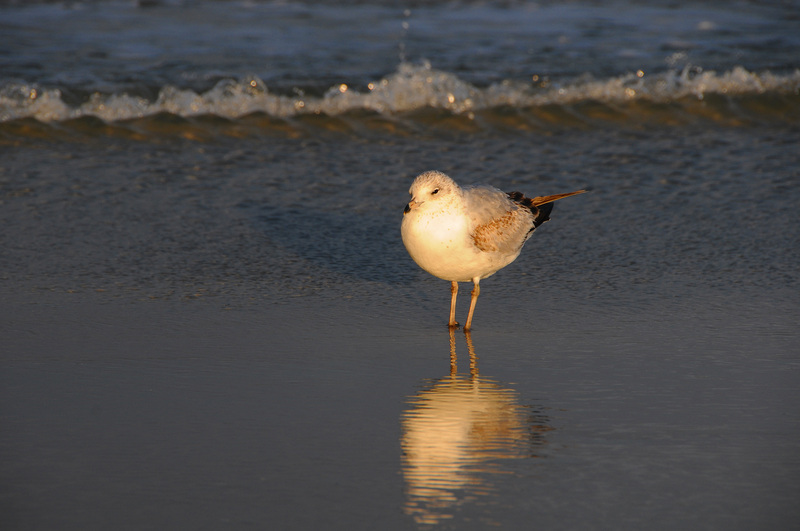 I did warn you with the title: “…, odds & ends…. On another day trip, we passed a field with these WILD looking cattle! Had to turn around…. 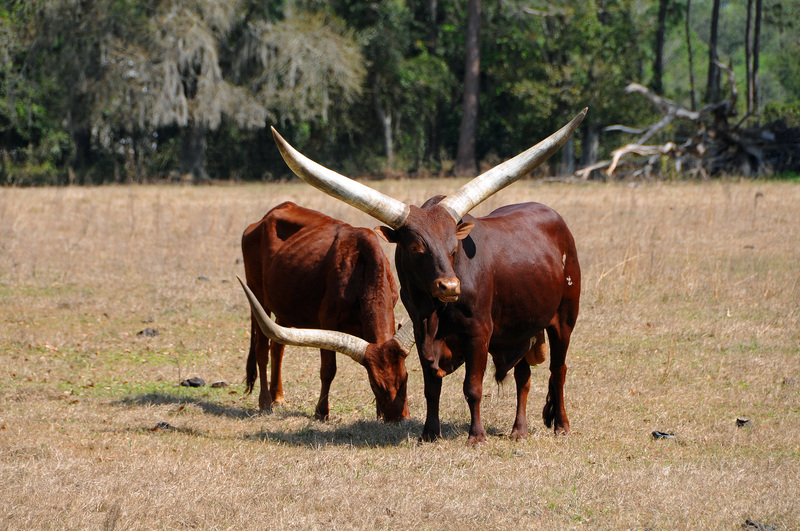 Turns out they are Ankole-Watusi, a breed from Africa. That can handle poor quality forage, and derives some cooling from those massive horns!